016 sees dance music’s best known spiritual pilgrims–the Visionquest group of Daniel Bell, Ryan Crosson, Lee Curtiss, Shaun Reeves, and John Tejada–continuing their sojourn through the ever dense forest of underground dance parties. While each of the three members of this DJ and production team contributes a distinct sense and sensibility, everything they ultimately craft resonates with a frequency that has become unmistakably visionquest-esque: slow-burning, shape-shifting, expansive techno and house marked by compositional elegance and unabashed hooks. Their accomplishments are legion. As a studio ensemble, they have dropped modern classic remixes for artists ranging from dance world stalwarts like Kiki and DOP to indie rock icons such as Tracey Thorn to the American auteur and visionary David Lynch. As a DJ team, they have captivated crowds at the biggest festivals and clubs worldwide, including Fabric, DC 10, Creamfields Buenos Aires, and Glastonbury. And their legendary Visionquest 13, a year long global tour that Ibiza Voice called a “collective expedition into the depths of your soul,” unfurled the Detroit rave unconscious onto a new mass of dance music seekers. And yet for all these personal accomplishments, Visionquest’s most gratifying one has been the community developed around the continued success of their eponymous label, launched in 2011. Since its inception, the Visionquest imprint has proven instrumental in heralding new and now well known talents such as Benoit and Sergio, Tale of Us, Laura Jones, and Chaim, along with remixes from techno and house royalty like Ricardo Villalobos, Carl Craig, and Pepe Bradock to name a few. In its approaching 5 year anniversary, the Visionquest label has reached its 50th release mark, securing its status as champion among men. No journey dwells in the past, though, even when it might find inspiration and strength there. 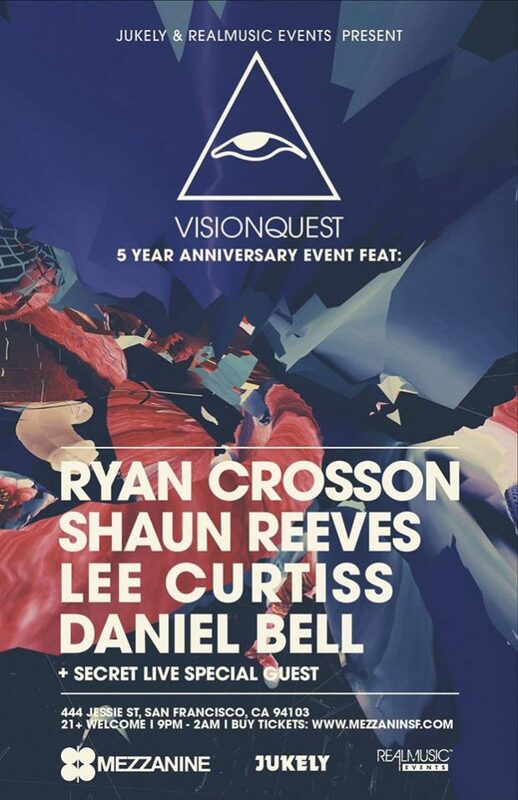 And so, Visionquest is poised to take on an expansive world tour to celebrate 5 years of the label alongside an array of artists and DJs who have played important roles in the growth of the project over the past half decade. Five years of Visionquest will be a gathering of old and new worlds, of old and new friends, of old and new gods, of the inner and outer spheres, of the sacred and the profane, of the one and the many.